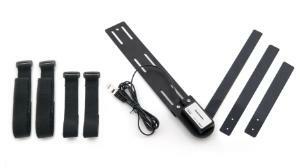 The Goniometer can be used to measure the dynamic motion of a limb during different types of physical activity. A set of elastic straps are used to secure the sensor to the subject. The lightweight and flexible joint arms allow the limb to move naturally. Use it with an EKG Sensor to measure muscle activity during limb motion. The sensor can also be detached from the base plate and flexible arms so it can be used in a variety of STEM and engineering activities. Goniometer includes joint angle sensor with base plate attached to static arm; 12-inch flexible joint arm; 10-inch flexible joint arm; 8-inch flexible joint arm; Two 24-inch elastic, hook-and-loop straps; Two 14-inch elastic, hook-and-loop straps; User manual. The Goniometer requires a compatible interface and software to collect data. Interface and software sold separately. Getting started with probeware.